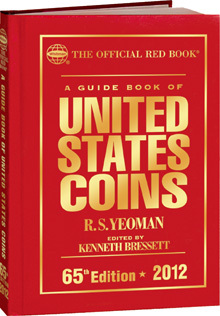 The Guide Book of United States Coins, or “Red Book,” is the most widely used and trusted general price guide on U.S. coins. The 2012 Red Book, which releases in early April, is the 65th edition. It is published by Whitman Books (http://www.whitmanbooks.com), the oldest and probably most prestigious publisher of numismatic books in the U.S. The book’s author, R.S. Yeoman, is one of the most well known numismatic writers in the country. It is edited by Kenneth Bressett, and a group of 140 top coin experts such as Q. David Bowers advise the authors on coin prices and the state of the market for each year’s edition. After 65 years as the best-selling published U.S. coin guide and with over 22 million copies in print, the Red Book has a devoted readership, and older editions are traded for substantial prices as collectibles. There are a variety of different formats, including hardback, spiral bound, cloth, leather, and large print versions, and beginning last year, Whitman also publishes a companion professional edition, which focuses on higher end and high grade coins, goes into greater depth on individual coin series, and includes data on certified coin populations. Whitman also has another Red Book series of books which are in-depth guides to specific coin series like Morgan dollars. When the book was first published, there was nothing comparable in the field. But today there is a wide range of other published and online price guides for those looking to learn more about their coins, or to determine the prices at which they are trading on retail and wholesale markets. An astute collector needs to be aware of the different values for the same coin depending on whether the coin is being sold retail, purchased wholesale by a dealer, bought at auction, etc. And since annual price guide values can quickly become obsolete, more timely sources like the PCGS and NGC online guides, or those like the Coin Dealer Newsletter, or “Greysheet,” which are published once a week are important, especially if you are a dealer, or a very active collector. Personally, I find it useful to draw from a variety of sources to determine values. In light of those considerations some people might ask whether they need a printed annual guide like the Red Book. I would argue that while some more advanced collectors may not need every year’s edition, less experienced collectors can benefit greatly from a Red Book, and more experienced collectors continue to find it useful as quick source of information when, for example, doing research or attending a coin show. Moreover, the Red Book provides far more than just a price guide for virtually every type of U.S. coin and numismatic item ever made. It also has mintage information, which is key to determining a coin’s value; information about specific characteristics of coins like weights and diameters; and lots of educational information about coins in general and collecting American coins. It provides an important snapshot of the coin market, which can be useful for tracking coin prices over time. It also has useful information about each U.S. coin series, such as how to identify the many different varieties of Bust half dollars. The 2012 edition of the Red Book includes almost 33,000 individual coins priced in up to nine states of preservation and over 1900 color photographs of pre-federal, federal, bullion, and pattern U.S. coins. It has updated and expanded coverage of every U.S. coin, token and other major numismatic item. It also has information on auction prices through early 2011, information on collecting Red books, a numismatic bibliography, bullion value charts, a glossary, and some new features such coverage of the new 5 ounce America the Beautiful silver bullion coins. In the past year, coin prices have been driven by two key factors, which are reflected in the new Red Book’s coin values. These are the sharp rise in precious metals prices, especially silver, which has more than doubled in the past year, and shifts in the rare coin market as a result of the state of the economy. Editor Kenneth Bressett said that while prices for rarer coins in exceptional condition remain very strong, many common, more low-end coins have declined in value, or risen strictly because of bullion values. He said that “Overall, there seem to be bargains to be had throughout the entire range of American coins now that prices have receded a bit from the overheated market of recent years.” Valuations editor Jeff Garrett, also a noted numismatic author, added that “In general coins with average eye appeal have softened slightly due to the weak economy. While many collectors and investors focus on bullion, rare coins offer tremendous value at today’s prices.” In upcoming articles I will be exploring some of the coins which seem to be undervalued in today’s market. I was pleased to see updated mintage and pricing information on modern U.S. coins, which as I have previously discussed, can be hard to come by. However, some of the data on modern coins such as first spouse gold coins are not the final adjusted mintages and only reflect sales as of a certain date. I would suggest checking articles on CoinUpdate.com and the U.S. Mint web site for mintages of coins made after 2008. And since prices for modern coins are so volatile because of precious metal content and the speculative nature of the modern coin segment of the market, I’d suggest checking eBay completed sale prices for the most current prices. More advanced collectors will probably be more interested in the professional edition of the Red Book, the second edition of which was published recently, but bear in mind that the professional edition does not cover lower graded coins (for most coins those below XF or AU). Louis Golino is a long-time collector, numismatist, and numismatic writer. His articles have been published in Coin World, Numismatic News, and other publications. He has also written widely about international politics for newspapers and web sites. It is rediculous the redbook cannot get mintages correct for 2006-2008 gold, silver and platinum eagles since those figures are on the mint’s own website. Sloppily they still leave out the coins that are contained in multi-coin sets. For example they have some burnished platinum eagles as having mintages in the hundreds, VERY misleading to a novice, and inexusable for the go-to reference guide of the hobby. Thanks for your comment, Yipee. You may want to send a letter to Whitman suggesting that the author and editors address these issues in the next edition. Try sending a letter addressed to the publisher, Dennis Tucker, regarding your concerns and suggestions. I will do the same.